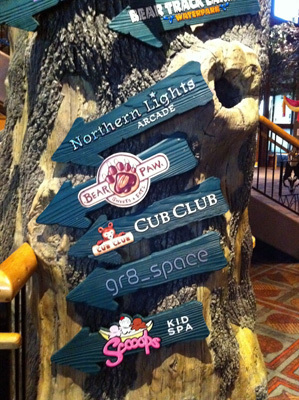 There are signs pointing the way to all of the different attractions housed within the lodge – there is a LOT to do here. I was also able to look through the windows and get an idea of what the water park is like. I couldn’t get over how big it was, especially for being indoors. The photo I took doesn’t show it all – there’s a wave pool and a large kiddie area over to the right. See that giant bucket? Every so often a wolf howls, a bell dings and people rush over to stand on the ground below. Then the bucket tips and everyone in the vicinity is soaked! 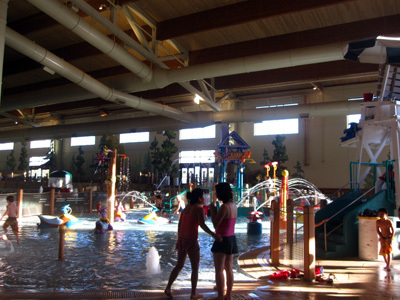 Here’s a photo of the kids’ area of the water park. 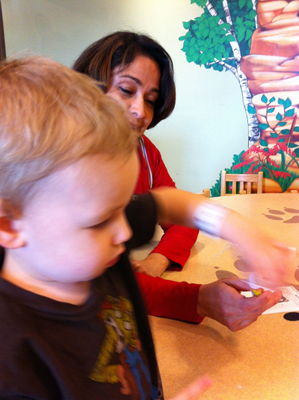 We were really impressed with what all there is for toddlers to do, and the boys just loved it. There are all sorts of spouts and sprinklers, and several slides to try, among other things. We spent most of our time in this area. 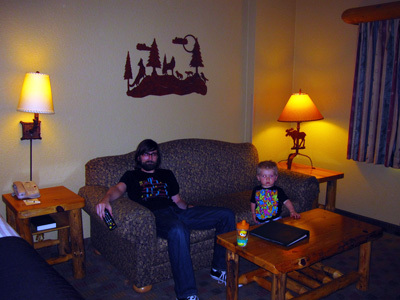 Of course, before we got started in the water park we went to get settled into our room. I was really impressed with the attention to detail with the decor. 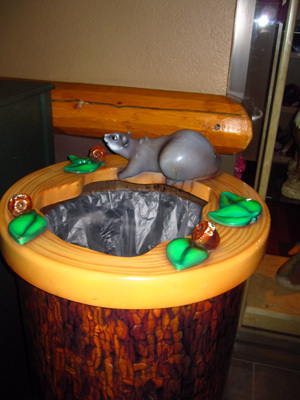 Even the trash cans are keeping with the theme! 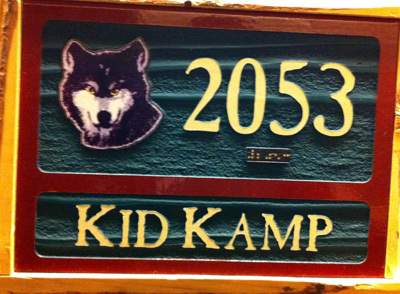 The signs designate what type of room yours is – we stayed in a Kid Kamp room, which has a living area with fold-out couch, a desk, a queen-sized bed, a snack area (with microwave & fridge), bathroom, and a great area just for kids! Here’s the living area – this space was great for hanging out and watching TV – we also brought pizza back here and had dinner around the coffee table. 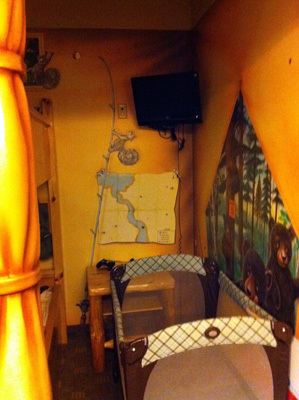 Here’s the inside of the kids’ area. 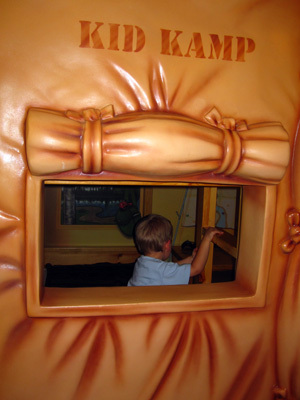 It’s got bunk beds, a night stand, a TV with remote & video game controller, and adorable murals on the wall that really give a sense of camping out. We brought the pack-n-play for C, and had enough space to put it there and still have a little walkway. See the attention to detail again? This really made the space feel fun. I took this shot to give you more of an overall idea of what the outside of that space looked like. 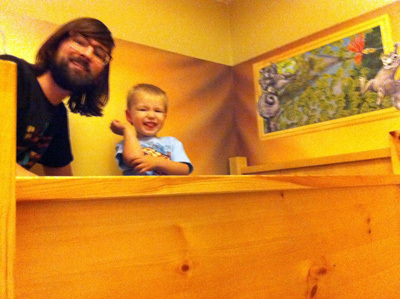 Brian and J tried out the top bunk. He was a little too young to try sleeping up there, but it was a fun hangout, anyway! After getting everything in the room, we got changed and headed down to the water park. One thing that I really liked is that the wristbands you wear upon arriving serve as your room key, so you don’t have to hang on to anything. You also have the option of loading your credit card information onto the wristband so you can make purchases throughout the lodge. We did this, and it was incredibly convenient. Like I mentioned above, we spent most of our time in the kiddie area. The water was deep enough that we could sit comfortably, but shallow enough that even C at 18 months could wade around easily. Great Wolf Lodge provides life vests and that gave us peace of mind, too. We did venture out a little bit that first day – we tried the Crooked Creek (lazy river) and piled our family onto a double inner tube. It was fun floating around together, and we went around several times. We briefly tried the wave pool, too. We didn’t get to venture out too deep but there’s a large shallow area to hang out in. After a couple of hours the boys started to get tired so we headed back to the room, and then I went out into the lodge to get dinner. I was really impressed with getting a large pepperoni pizza for $12.99 – I had expected to have to spend a lot for dinner, but that was a reasonable option. We also could have brought our own food to eat in the room, which is another way to make it even more affordable. I wandered around a bit to take in all of the different options for things to do – from MagiQuest (a fun interactive game that takes place all over the hotel) to an arcade, from a spa for grown-ups to a spa especially for kids, there were a lot of other things to do even beyond just the water park. The next morning we got up and had breakfast in the Loose Moose Cottage. The buffet was really impressive – they had a ton of offerings including fresh fruit, sausage, bacon, eggs, belgian waffles, and more… plus a custom omelet station. Again, we could pay with our wristbands so we didn’t have to bring anything with us. I also loved not having to hop in the car to go somewhere. I think that’s often what makes traveling (with young kids, anyway) exhausting. Checkout at Great Wolf Lodge is at 11, but you’re allowed to use the water park until it closes the day of your checkout. We packed everything up in our car and put a bag of stuff together for the day, then headed back to the park. Brian and I took turns trying some of the larger slides, and both really had a lot of fun – there are truly things for all ages to do. When the boys seemed to start getting tired the boys and I got changed (they have spaces provided for this, which made the process a lot easier than I had anticipated) and headed over to Cub Club while Brian rode on a few more of the bigger slides. Cub Club was a lot of fun – they had a variety of craft options to choose from, all in a kid-friendly, colorful atmosphere. 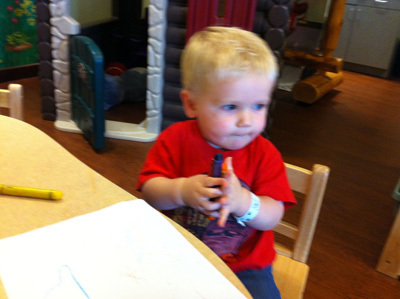 C is a little too young to make crafts, so he colored with the crayons and paper they had provided. J decided to make a puppet, and the staff member that helped us was really great with him! Laura praised him and made him feel really special. The puppet just cost $3 to make, which I thought was really reasonable as well. It was a great way to spend our time while we waited on Brian. 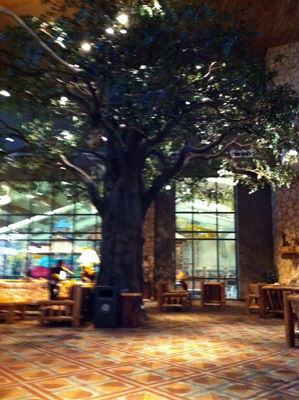 Overall I think Great Wolf Lodge provides a good value for money spent. 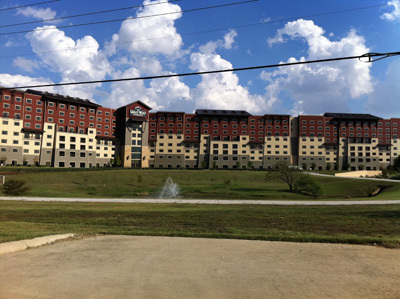 The rooms (at least when we were there) start at $199 – with a maximum occupancy of 6. That also includes admission to the water park on the day of check in and check out. So, assuming you have 6 people, that makes it about $33 per person – really not bad at all. Parking is also free, which helps a lot too. The ability to bring your own food also gives you the option to make it more affordable. Since everything is on-site it’s easy to run back to your room to eat. As far as food options go, I thought the pizza was well-priced. The buffet was a little steep for what we normally spend, but kids 3 and under eat free so that averaged the price down, and if you are a big eater you can get a lot for your money there as well. I did feel like the A&W restaurant in the water park was overpriced – $7.49 for a kids’ meal – but we were able to find some less expensive options to have a snack. 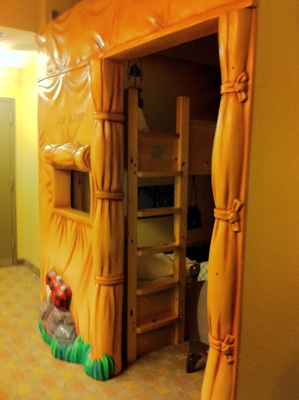 Great Wolf Lodge really goes all out to make a stay there feel like a complete experience. It would be a fun place for a couple to go too, but this is by and large a family-friendly and family-centered place. We loved it, the boys loved it, and we have already decided we want to plan a trip back sometime soon. 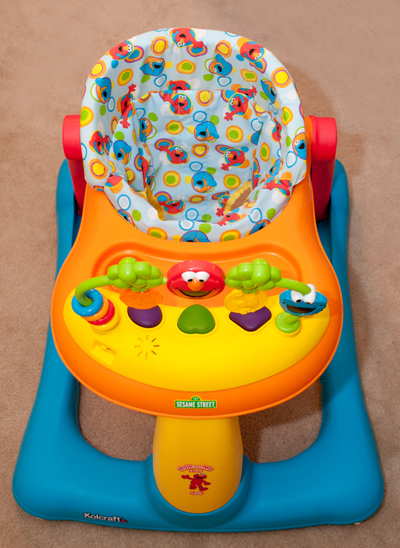 We left feeling relaxed and rejuvenated – and any parent of young children knows that is saying a lot! 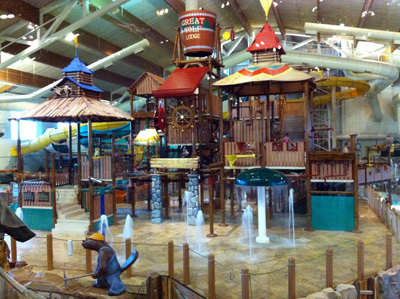 The fact that the water park is indoors means we can even go in the middle of winter and escape the cold (it is always kept at a comfortably warm temperature). I wouldn’t be surprised if we end up going back sometime in the next few months – if we do I’ll be sure and take photos, because I’ve heard they decorate for the holidays! 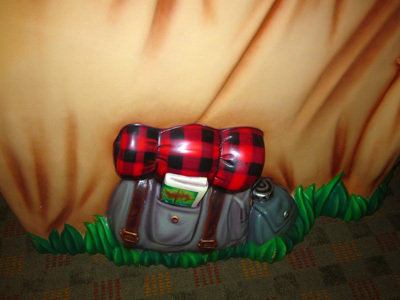 A friend of mine recently said they’re making it a priority to provide more experiences for their kids rather than things, and the Great Wolf Lodge provides a fun experience that will be sure to provide many memories for your family. 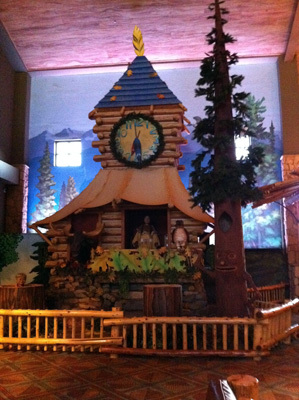 Note: We received a reduced media rate to stay at the Great Wolf Lodge. However, all opinions are honest and are my own or my family’s. I was not compensated monetarily for this review. Looks like you guys had an amazing time! I have always wanted to check this place out!